Why can’t I see my doctor after I was hurt at work? 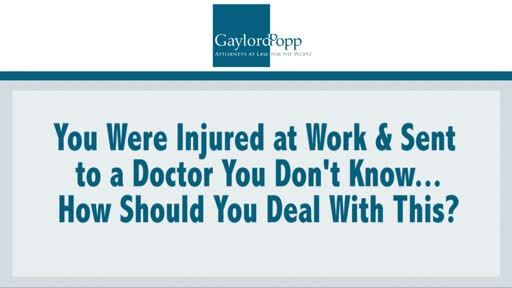 You’ve been injured at work and you’ve been sent to a doctor who you don’t know. The law specifically says when you get hurt at work, the insurance carrier gets the right to control the medical care and will forward you to their doctor. Sometimes they’ll send you to an occupational health clinic, sometimes you will get sent to a specialist. You may not like those doctors, so you have the opportunity to make a request for a second opinion. The insurance company doesn’t have to send you for a second opinion, and if they don’t, you would have to attempt to get that medical treatment on your own. Aworkers’ compensation attorney could then file a specific motion and work with workers’ compensation judge to get that treatment authorized. As a result of this, you may have some additional questions concerning this information. If you do, I encourage you to pick up the phone and call our New Jersey offices at 888-982-7830, or send me an email at sgaylord@gaylordpopp.com.